Getting the yen to spend a week or so in NYC this autumn, and while doing a little research I've discovered a new way to see the place. 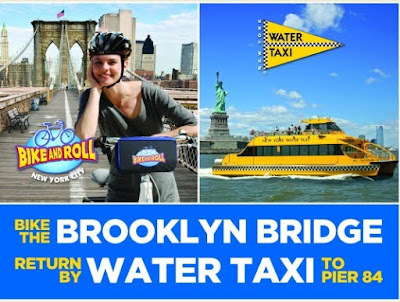 New York Water Taxi and Bike and Roll NYC have joined forces to let you bike across the Brooklyn Bridge and take a Water Taxi back. The companies describe it as "part instant adventure and one part jaw-dropping views. It’s easy, safe and fun, and you don’t have to be Lance Armstrong to do the ride--all levels of riders can enjoy this excursion." The package includes an 8-hour bike rental, a Water Taxi hop-on/hop-off pass, a four-color route map indicating sights along the route, and a helmet and bike lock. Highlights include a close glimpse of the Statue of Liberty as you cruise by on the return trip. Excursions available at two Bike and Roll locations: Pier 84 (West 43rd Street) or Battery Park (just west of Pier A). Pick up your bike as early as 9 a.m. and get a nice early start. Get the return water taxi ride at Fulton Ferry Landing at the base of the Brooklyn Bridge. It will take you to Manhattan's South Street Seaport, Battery Park, or Pier 84/Weswt 44th Street. For more info, visit the Water Taxi website. 1. Some healthy foods were more expensive than less healthy foods, but in other cases, healthier options were less expensive. Whole grains were more expensive than reined grains across the United States, with prices ranging from 23 percent higher (San Francisco) to more than 60 percent higher (nonmetro Pennsylvania and New York) than for reined grains. Fresh and frozen dark green vegetables were more expensive than starchy vegetables in all markets (prices ranging from 20 to 80 percent higher than starchy vegetables), but orange vegetables (e.g., carrots, sweet potatoes, and winter squash) were less expensive than starchy vegetables in some markets, including metro New York, San Francisco, and Florida. Low-fat milk (skim and 1%) was between 10-20 percent less expensive than whole and 2% milk in most markets. Low-fat milk was more expensive than nonalcoholic carbonated beverages in some markets, but less expensive in others. Bottled water is the same price or less expensive than soda in all but one market (urban New York), with a price ranging from 6 percent (Boston) to over 33 percent (San Francisco) lower than the price for soda. 2. Prices of healthy foods vary widely across the United States. 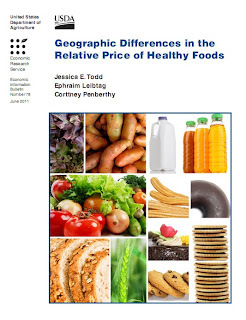 Whole grains, dark green and orange vegetables, low-fat milk, and fruit juice demonstrate the largest geographic price variation. 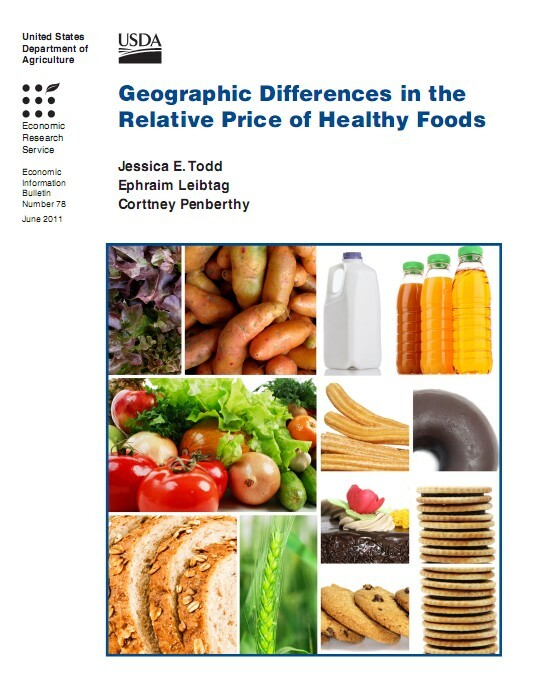 The geographic variation in the price of whole fruit when compared with sweet or savory commercially prepared snacks is generally smaller than that of other comparisons. On a per-gram basis, whole fruit is 60-70 percent less expensive in all markets. 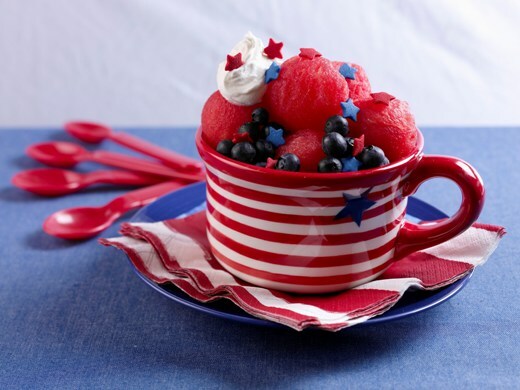 From the National Watermelon Promotion Board come some fun and colorful ideas to brighten up your Fourth of July celebration. For more information about watermelons, including recipes and health/nutrition data, visit www.watermelon.org. Gently mix together the watermelon and blueberries. Divide among 4 bowls or cups. 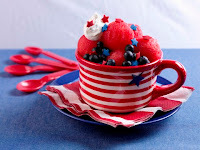 Top each with a dollop of whipped topping and decorate with red ,white and blue sprinkles. Serve immediately. In a non-stick sauté pan over medium heat, toast the almonds while constantly stirring to prevent burning. When they are golden, remove them to a heatproof tray or foil to cool. 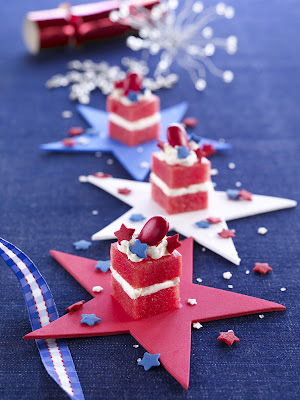 Cut the watermelon slice into 6 to 8 pie-shaped wedges. Dip the back (curved) side of each slice in the yogurt and then the almonds, re-assembling the pieces on a serving platter as you complete each piece. 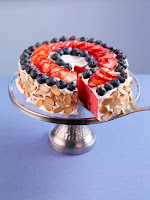 When finished, it will look like a piecrust of almonds around the watermelon slices. Frost the top of the reassembled watermelon with the remaining yogurt and decorate the top with the berries. Drizzle the chocolate syrup over the top. Serve cold. Arrange watermelon cubes on a serving platter. Place the frosting in a Ziploc bag and trim off a bit of one bottom corner. Decoratively pipe the frosting onto each watermelon cube. Place an almond at the top of the frosting on each petit four. Decorate with sprinkles and serve on red, white and blue table decor.